Did The Giant Sloth Die Out Less Than 150 Years Ago? The giant sloth, or mylodon, was once thought to to have gone extinct long before humans arrived in South America. Some people now think that it may have been alive in the 1800s. You decide. It started with archaeological evidence of a giant sloth that died from being roasted alive in a pit — either the work of humans or very smart and envious smaller sloths. Then there was a dig that turned up two human skeletons, and the partial remains of the giant sloth they'd been eating. That brought giant sloth extinction forward to no more than forty thousand years ago. The next adjustment to the clock came not from fossil evidence, but from the library. Biologists discovered the preserved journals of a 16th century explorer. André de Thevet was a priest, despite the notable handicap of not being especially religious. He did like books, though, which explains why he faithfully kept a journal as the Franciscans and the French government sent him around the Middle East and northern Africa. Later in life, he set out for Brazil, carefully documenting the culture, the geography, and the wildlife he found there. Thevet became the first European to document animals like the macaw and the tapir, and the fact that Brazilians cultivated tobacco and peanuts. The combination of accurate information about culture and nature indicates that he's a credible source among early explorers, who often told tall tales about their travels. In his books and journals, he talked about how people in Brazil would hunt a very large animal whose description matches one of the smaller species of giant sloth. Some kinds of mylodon might have been around less than 500 years ago. Or even less than a hundred and fifty years ago. In 1895, in Chile, a farmer discovered a large piece of hide near a gigantic cave. He hung it over a tree, as a local curiosity, and Swedish explorers touring the are hacked off a piece. Back in Sweden, naturalists analyzed what seemed to be tiny bumps on the skin and found them to be "dermal ossicles," which are found on sloths. Further explorations of the cave revealed stratified layers of bones, hair, and dung going back thousands of years. The cave had been routinely used by giant sloths. The question was, how recent was its last use? 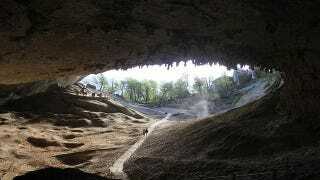 Some people think that the piece of skin that the farmer found was ancient, and found its way to the entrance of the cave after animals or other humans hacked it off from one of the older specimens near the back of the cavern. Others think it was contemporary, and that some giant sloths still existed in the 1890s. Some even think that, deep in the wilderness, the sloths still exist. I doubt it, but I'd love to be proved wrong.